" I was discouraged and planning on quitting, but after today the Lord has renewed my vision to continue on." Each workshop is designed to teach specific skills, present ideas that can be used immediately, and equip your people so they can come up with their own applications. 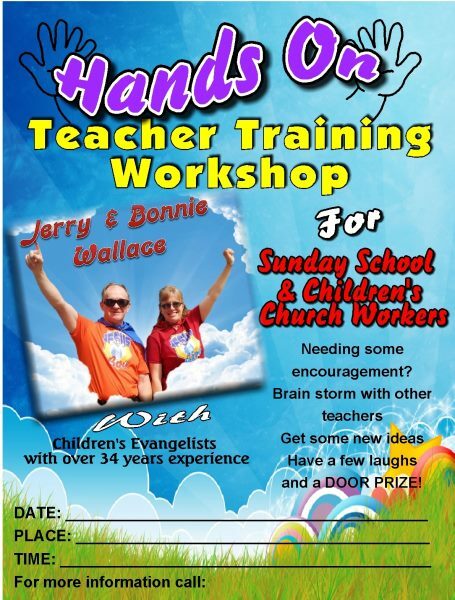 The Wallaces teaching style is filled with humour and practical down to earth ideas. This workshop covers : What is the Gospel? Can Children believe the Gospel? A fun hands on workshop giving you some practical tools to use. Learn how to use music, video, games, cartoons and puppets to make your class time come alive. ​With a little practice your puppet will be a hit and you don’t need expensive puppets or puppet stages. ​Learn how to reach your students with more than stories and facts. The greatest lessons you teach will not be from a Sunday School quarterly but from your life. ​ Covers the three basic needs of all children and several tried and proven problem solving technics. We study a outrageous class situation where my puppet student Suzy who is a hyper active puppet tries my patience and shows up my teaching weaknesses. We brain storm on how I could have handled her differently. Also covered in the workshop is how to keep yourself safe from physical and sexual abuse charges. ​ Story telling scares more new teachers than perhaps any other facet of teaching. This workshop takes the fear out of telling a story with some fun easy tips. ​ This workshop looks into four different learning styles you may have in your class room, from the girl who loves to listen and fill in the blanks to the boy who would rather use his hands to create something. How can you effectively teach both styles of learning in one class. 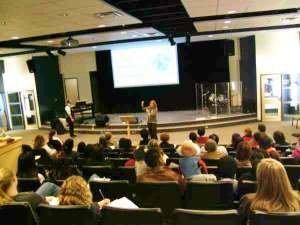 ​ This workshop is designed to help the teacher share with their students the gospel and how to lead them to Christ. This workshop uses the Wordless book colors to explain the Gospel. Some churches have invited other local churches to take part and charged a small fee. 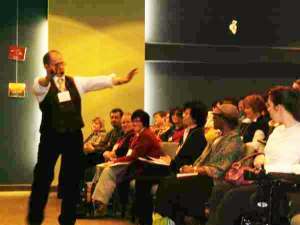 Leading a workshop at "the Vault" Ottawa's annual Children's Workers Conference. Plan a Saturday morning workshop to refresh and renew your teachers.